Your eyes and their needs are individual to you; there is no one size fits all and that is why an eye examination at Suil Eile Optometrists is tailored to each individual. 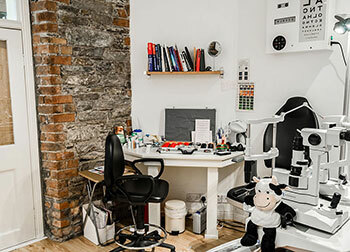 We place the emphasis on your eyecare and you can be assured of a professional eye exam in a relaxed consulting room using only the most up to date clinical equipment. A complete eye examination at Suil Eile optometrists will typically lasts approimately half an hour. Our optometrist will begin by asking some questions about your eyes, any problems you are having, and any symptoms you are concerned about. We will also ask you for some information about your medical history and any significant eye problems affecting your family. We may ask questions about your hobbies and leisure activities, your work environment and any other factors that appear to be relevant. It is important to answer these questions as honestly as possible as this enables our optometrist to tailor the eye examination to your needs. The examination routine typically begins by measuring your visual acuity; this evaluates how clearly your eyes see for both distance and near. Refraction is normally carried out after measurement of acuity; this is where the optometrist calculates the lens prescription to enable your eyes to see to their full potential. Refraction involves a number of steps and is tailored to the capabilities of the individual. Some refraction techniques require the patient to be verbal and others require no input from the patient, these methods are used for very young children or patients with learning difficulties or specific needs. The following section of the eye examination is to evaluate the health of your visual system, these tests not only check the health of you eyeball but also the whole visual system which includes the visual pathway in the brain. The optometrist will look at your pupils to evaluate neuro function , she / he will examine the external eye structures of the eye including the eyelids, the cornea and conjunctiva. Internal examination of the eye includes examination of the fluid at the front of the eye(aqueous humour) the iris, lens vitreous gel, retina and its blood vessels and the optic nerve. We may measure the pressure inside your eyes to detect glaucoma. At Suil Eile Optometrists we have a Zeiss Humphrey Visual field analyser, this visual field screener is the gold standard in visual field testing. It is used in hospital eye departments to detect and monitor glaucoma as well as other neurological conditions. It is also suitable for driver vision testing for both Group 1 and group 2 driver licenses. We also use a Zeiss digital retinal Camera to photograph the back of your eyes, this can help us detect subtle changes over time and comprehensively examine the health of your eyes. New regulations since 2009 require all HGV license applicants to have a special eye examination to check their periperhal vision, contrast sensitivity, glare sensitivity and visual acuity. This service has a limited number of providers. Sue has a special interest in Paediatric eye care as well as vision care for children with special needs. She has completed a number of postgraduate courses in vision problems found in children with Down Syndrome and learning difficulties. People and children are more prone to eye problems and therefore have specific eye care needs. They often require stronger glasses due to higher prescriptions, they are known to have difficulty focusing on objects up close and sometimes need bifocals at an earlier age to help with reading. People with Downs Syndrome are more prone to certain eye conditions such as blepharitis, cysts and styes meaning their eye lids often appear red and flaky. Cataract and Keratoconus ( a cone shaped cornea) are also more common. Approximately 60% of children with Downs syndrome require glasses and about half will have a squint or lazy eye. Is the eye examination different for people with Downs Syndrome? All individuals with Down Syndrome should have an eye examination at least every 2 years. It is important that the optometrist is aware of the specific needs of individuals with Down Syndrome. We are often asked how we test children and adults who have communication difficulties. We use special charts which are designed for children and adults with intellectual difficulties, these charts use pictures or shapes or sometimes images of varying contrast. The prescription is measured using a retinoscope so the individual is not required to tell us what lens is better or worse or if they prefer lens 1 or lens 2. Eye drops are often necessary to allow the optometrist examine the back of the eyes and determine the most accurate prescription of the glasses. We will provide specific lifestyle advise to help individuals use their vision to the best of their ability. Simple methods such as using a dark marker instead of pencil will improve the contrast of writing on the page for people with Downs Syndrome. It is known that individuals with Downs Syndrome can have reduced contrast sensitivity. The facial features of children and adults with Downs Syndrome is different. Therefore it is extremely important to take this into consideration when fitting them with glasses. Their nose is often flat and small, the length from the back to the front of the head is shorter. Poorly fitted glasses will often slide down their nose or rub off their eye lashes. Frames often require personal modification for the individual with Downs Syndrome and at Súil Eile the 'one fit suits all approach' is not used. Sue our optometrist has completed specialised training in assessing the eye care needs of individuals with Downs Syndrome with the renowned Downs syndrome eye care specialist and researcher Dr Kathryn Saunders at the University of Ulster.